Staying in is the new going out. Many couples are choosing to spend Valentine’s Day at home, rather than going out for a fancy meal. We asked April Davis, founder and CEO of luxury matchmaking website LUMA, what she prefers. The comfort of your own home is a good reason to keep Valentine’s Day 2017 indoors. Grab a blanket, put the heating on and enjoy some time with your other half. Here are our tips to make the most of your evening in. What’s a romantic night in without the right atmosphere? First, make sure that the house is clean and tidy. Dirt and clutter will not help to create the right mood. Does your partner often handle the cleaning? Taking care of the whole house is a great way to give them a break and show you care. Start the night off right and create a clean space for your partner to come home to. Does your loved one have a hard time relaxing in a messy house? Cleaning up could mean a lot more to them than a box of chocolates! As April is our expert on all things romance, we asked her what is needed for the perfect Valentine’s night in. Mood lighting has long been a staple of the romantic evening. Incense can give you a chance to shine if you know your partner’s favourite scents. Scattering rose petals is also a popular choice – yes, we know we just told you to clean the house! You can brush them up afterwards. Staying in for the night means you and your date don’t need to dress formally. If you both like to look your best, there’s nothing stopping you! This is a great way to show your partner they’re always worth dressing up for. Build a playlist of songs you know your partner likes, or that are meaningful to you both. Play this in the background, at a special moment, or for a slow dance. A good evening deserves a good meal. If you’re skipping the expensive restaurant, spend some time creating a menu of your own. If you don’t usually cook, look up a recipe that you think you can manage. Your partner will appreciate the effort, no matter how it turns out. Cooking with your partner can also be a fun way of bonding. Just keep in mind that some cooks prefer to work alone. If cooking isn’t your thing, there’s nothing wrong with ordering a takeaway. This takes some of the pressure off and means you can spend more time together. Try to pair your dish with a wine that suits it or one that your partner enjoys. If you want to mix things up, why not get creative and pick up the ingredients for some cocktails instead? You can have fun making them with your partner, or mix the drinks beforehand to surprise them. 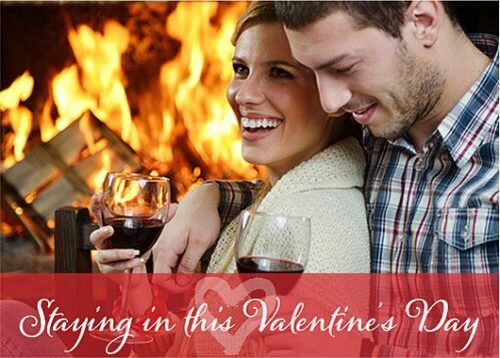 There’s no shortage of romantic ways to spend your evening. Of course, it will be down to what the pair of you enjoy. Many couples like to watch a movie together. It’s best to find a film that you both like, but this can be easier for some couples than others. This is a good place to start and gets you talking about what you enjoy. With on-demand and streaming services, you’re bound to find something you can agree on. With food and a film at the ready, it can be fun to have a picnic on the living room floor. Clear a space, and gather up some cushions and blankets. Then find a good spot, and get cosy for the evening. This is also a great option if you’ve cleaned the carpet and want to make the most of your work! If films aren’t your thing, you could play games, do some art or simply spend time talking to each other. If you’d like to have your house looking its best for Valentine’s Day, look up your local Rug Doctor rental store and give your carpet a deep clean. You never know, the Rug Doctor could be your new Love Doctor!